What is a Rigid Gas Permeable (RGP) lens? Rigid Gas Permeable (RGP) or just Gas Permeable lenses are not the same as the old style HARD contact lenses, which are now no longer used. Hard contact lenses were made of a material known as PMMA or Perspex. Most GP lenses contain silicone that is oxygen permeable, so oxygen can pass through the lens giving greater comfort and better eye health. Often GPs transmit more oxygen to the eye than do traditional soft contact lenses. GPs can also provide clearer vision, durability, and deposit resistance than soft contact lenses and they can be easier to clean. Since they’re long lasting, they can be less expensive than soft lenses over time. Are RGP contact lenses comfortable to wear? Yes, but it may take between 10 days and 1 month before they settle in. They are certainly less comfortable initially than soft contact lenses but after they have settled they are equally comfortable, and GP lenses are more comfortable in the long term. Over time your corneal sensitivity decreases and you should not be aware of your new GP lenses in your eyes until after 10-12 hours of wear. Due to our windy/dry climate, air-conditioning and computer work, the lenses can dry out and become uncomfortable sooner. How do RGP contact lenses correct distorted vision? If you have had previous eye surgery/trauma or have a condition called Keratoconus then your cornea may be irregular in shape. A GP lens vaults right over the top of your cornea to provide a new clear, regular surface for the light to refract on. Between the back surface of the GP lens and your eye your tears fill in any irregularities, resulting in clearer vision with reduced glare and haloes. How long do RGP contact lenses last? If the lenses are well cared for and kept clean they can last for up to 2 years, in some cases even longer. We recommend regular 6 monthly checks and as long as the lenses are fitting safely, providing clear vision and are comfortable, there is no need to change them. On your first day, start at between 3-4 hours of wear and for every day after that try for up to 1 hour longer. If you can only get 10 minutes longer per day that is OK. Often the slower you get used to the lenses, the better your long term comfort will be. Your eyes do undergo some physiological changes when you start wearing GP lenses, so you need to slowly get used to them. At the first sign of discomfort take the lenses out and try for a bit longer the next day. How do I insert my RGP contact lenses? Remove the lens from its case by putting your finger onto the lens surface where it should stick. You should then be able to lift the lens out. If you wipe the lens up the side of the case it can scratch/chip the lens edge. 1) Balance the lens on the tip of your forefinger. 2) Add a fresh drop of conditioning solution on the lens to cushion it onto your eye. 3)Pull your lower lid down with the middle finger of the same hand. 4) Hold your upper lid firmly near the lashes with your other hand and press the eyelid against your eyebrow, so you cannot blink even if you want to (test this out by looking in the mirror and trying to blink). 5) Whilst looking straight at your eye in the mirror put the lens in the middle of your cornea (centrally). 6)Release your lower lid first, then SLOWLY let go your upper lid and blink. 7) If the lens does not feel comfortable, remove it, clean it and re-insert. Note: If the lens is not central (out on the white of your eye) gently move the lens by pressing on it through your eyelids. Or close your eye and again move the lens by pushing through your eyelid. Don’t press directly on the lens with your finger but use the edge of your eyelid (by pushing on it with your finger) to move the lens. How do I remove my RGP contact lenses? This method uses your eyelids to effectively “blink” the lens out of your eye. The lens can come out quite quickly so ensure you are ready with your hand to catch the lens. 1) Look straight ahead with your eyes open as wide as possible (staring). 2) Place your forefinger vertically at the outer corner of your eyelids and press then pull your finger towards your ear and slightly upwards. 3) Open your eyes wide and blink firmly. As you blink the lens will come out so you need to be ready to catch the lens with your other hand cupped under your eye. 4)If the lens does not come out the first time, relax, have a few blinks and repeat. This makes it much easier to remove the lenses but you need to remember to carry it with you whereas if you learn the blink method you will always have your fingers with you! 1) Wet the surface of the suction holder with some conditioning solution. 2) When the holder has suctioned onto the lens gently take the lens off your eye. 3) To remove the lens from the holder slide it to the side rather than pulling it off directly which can result in the lens bending out of shape. 4) If you are using an air-suction holder press it to remove the air before putting the sucker into contact with the GP lens and releasing the suction. The lens should now be stuck to the sucker and it can be removed. Again slide the lens off sideways. 5) The suction holder should be cleaned regularly with your contact lens cleaner rinsed with conditioning solution and left to air dry. Wash with soap and running water, remembering to rinse your hands thoroughly. Dry your hands with a towel. It is important to clean your RGP contact lenses daily to maintain the highest standards of comfort and visual clarity. Each day after you remove your lenses, you must clean them prior to overnight storage. ALWAYS use the prescribed cleaning solution, which serves as a cleanser and disinfectant. It also increases the comfort of your contact lenses. NEVER use saliva, saline or water of any type. Tap, distilled and bottled water (and particularly saliva) contain bacteria and viruses which may be absorbed by the contact lens and cause eye infections. 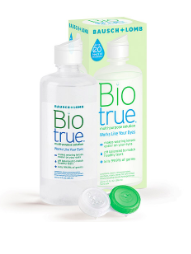 1) For rinsing your lenses, use only BioTrue. 2) Place the lens bowl-side up in the palm of your hand and apply a few drops of biotrue. With the pad of your finger gently rub the entire lens in a circular motion against the palm of your hand. Be sure to thoroughly clean the entire lens and then rinse it well in a steady stream of biotrue. 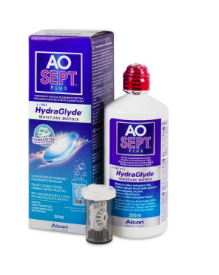 3) For disinfection use AOSept Hydrogen Peroxide Disinfection System. Carefully follow the instructions for the specific disinfection system you use. 4) Always soak lenses in the provided lens case for at least six hours prior to inserting into the eye, so we recommend you do it overnight. 5) Use only the case provided with the AOSept disinfection system. Be sure to soak the lenses a minimum of 6 hours before inserting again. Note: NEVER put AOSept directly into the eye. 6) Never rinse lenses with AOSept prior to insertion into the eye. Solution must be neutralized. 7) Never use AOSept® Plus in a flat lens case. 8) Always use fresh solution when storing your lenses. Never “top off” or use old solution. 9) Always discard the old lens case to avoid contamination and ensure proper neutralization. Always check the expiry date of the solution. When you open a new bottle, write the date you need to discard it (generally 3 months after opening) on the container in a felt tip pen. Do not use out-of-date solution. Bacteria can accumulate in contact lens cases. After putting in your contact lenses, the case should always be emptied and air-dried. A new contact lens case is included with every purchase of contact lens cleaning solution. Always throw away the old case and use the new one. The case should only be filled halfway with solution (if over-filled, the lens may ride up and be damaged by the lid). The use of the contact lenses past these dates is NOT recommended as the lenses are not structurally or functionally designed to last any longer. The material often breaks down after this date, causing irritation and poor vision. In most cases you should remove RGP lenses before sleeping. Stagnation of the tear layer behind the lens could lead to a higher risk of eye infection. Since most of the people who need RGP lenses have already had some trouble with their eyes, further challenge to the surface of the eye would not be advisable. The safest option for waters sports is to wear goggles. Water contains germs, which may then contaminate the contact lens. Wearing your contact lenses after these activities would be the same as wearing your wet swimsuit. In the event you get water splashed in your eyes, make sure to remove your lenses and clean them thoroughly. It is not recommended to swim in fresh water even if it’s flowing freely due to the risk of infection from Acanthamoeba, which can cause severe loss of vision. Avoid wearing contact lenses in hospital or while unwell. Hospitals are often sources of infection. When you are sick (even just with a cold or flu) you risk spreading infection to your eye via contact lenses. You may also find it more difficult to manage your contact lenses safely while you are recuperating. The humidity in aircraft cabins is very low. If you wear your contact lenses they will become very dry and uncomfortable, and you will arrive at your destination with sore eyes. Please wear your spectacles for flying. What are the normal adaptation symptoms I can expect? You may also notice a slight blur to your vision when you wear spectacles straight after removing your contact lenses. This should clear within 30 minutes. If you want to swim in your lenses then you must make sure to use goggles and then disinfect the lens thoroughly afterwards. It is not recommended to swim in fresh water even if it’s flowing freely due to the risk of infection, which can cause severe loss of vision. One of my contact lenses is suddenly uncomfortable, what should I do? The first thing to do is to take the lens out. Does that fix the problem? If so, it is probably due to the lens rather than your eye itself. Now clean the lens thoroughly and put it back in. If that fixes the problem then there might have been something on the lens. If not then remove the lens again. Now you need to carefully examine the edge of the lens in bright light. You might notice a small tear or nick out of the edge of the lens. The lens would need to be replaced so please contact us. In the above scenario if you remove the lens but your eye is still hurting it is likely that there is something wrong with your eye. That means it would be best to come and see us straight away to have it checked. We normally like to see you about 1-4 weeks after picking up your lenses and then again at 3 months, 6 months and at least every 6-12 months thereafter. This is so we can review the health of your eyes and suggest any improvements in your contact lens prescription, lens design or material. If you do not return for regular after-care checks we are legally unable to supply you with contact lenses, as they are a health appliance. Always wear your contact lenses to your contact lens appointments, having had them in for at least 2 hours. Please remember to bring your case and spectacles with you. Please note, all prices are a supply for both eyes and are subject to change at any time. You have 3 months to change the parameters until we find the perfect fitting for your eyes. We offer a 50% store credit if lens is unsuccessful on return of the lenses. Sorry, we do not provide warranty for loss of lenses. What happens if I break my lens? New lenses are covered by a warranty against breakage for the first 3 months (Please note: you will need to ensure you return the broken lens). After this time we will replace the lens to the same prescription at a 30% discount. Should I keep a spare set on hand? It is a good idea to have a spare set of lenses on hand because a new set can take 10-14 days to be made. We can offer a 30% discount on all duplicate lenses purchased. Please speak to your Optometrist for the details. We can give a 50% refund on RGP lenses. Please visit us in store, or speak to your optometrist for more details. Please note we do not give refunds on fitting fees. Please see our office policy or speak to your optometrist for further details.